It is crazy to think that 2018 has now come to an end and we are getting ready to embark on 2019. 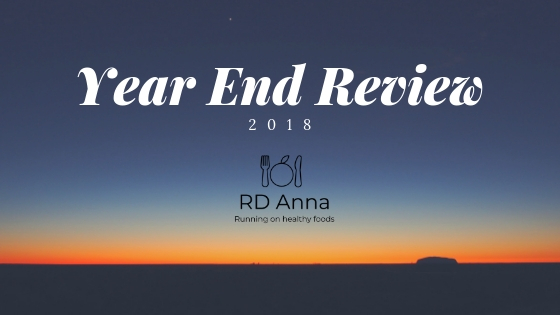 It has been such a great year filled with so many neat surprises and I am eager to look forward and see what 2019 holds for myself, for RD Anna and for my family. Weekly Blogging - Successfully accomplished. I was so excited to be able to write and share with you all 52 blog posts in the last year! Also posted daily nutrition information on the RD Anna Facebook page almost every day to share a variety of nutrition information with followers. Media Contact for St Vincent - Successfully accomplished. I was able to do 6 TV media interviews and then 1 Newspaper interview as well over the last year in the greater Indianapolis area. Writing a chapter for AND’s Nutrition Communication book - Successfully accomplished. This was such a neat project and an amazing process to be a part of. I am excited for the publication of this book in 2019 and to get to see the chapter that I helped to write! Test Question Writing Committee for CSPCC (Certified Specialist in Pediatrics in Critical Care) - Successfully accomplished. This opportunity came my way unexpectedly, but was a neat process to be a part of and I learned so much about how standardized tests are created and written. Wrote article for the Building Block Newsletter for the Pediatric Nutrition Practice Group on RDNs working to create separate breast milk and formula preparation areas. I was excited to get this draft sent off at the end of the fall and eager to make edits and have this article published in the spring of 2019. Continue with weekly blogging. I have really enjoyed putting together various nutrition content for the blog and sharing that information with you all. If you have any ideas or suggestions, please feel free to Contact Me and let me know what you would like to learn more about! Continue to serve as a media contact for St Vincent and do TV, Radio or Newspaper interviews as needed. Continue to grow my contracting outpatient nutrition counseling business with Mini Minds in Carmel, IN. This undertaking has been quite the learning process. I am hoping to pick up more clients and do more outpatient counseling as the year goes on and continue to do some class education as well for families. Work to complete additional hours towards a Lactation Counselor certification and renew the Certified Specialist in Pediatrics Exam. I am always working to learn more and advance my nutrition knowledge. I am hoping to continue to do this through completing the necessary coursework and obtain some additional certifications. Run as a national candidate for the Academy of Nutrition and Dietetics Ballot as a At Large House of Delegate in the category of 30 years and younger. I decided to give this a try and just go for it. Elections will be held at the beginning of February. I always think that is fun to take a moment and look back over the last year and see some of those analytic data that I can get from running a website. It is so fun to see more people being exposed to the content that I provide and hopefully increasing that impact that I am able to have! In the last year, RD Anna has had 2,025 page visits which is an increase of 26.2% from last year (that is any where from 121-218 page visits per month). During the last year, 1,924 unique IP addresses were looking at my content, which is an increase of 35.9% from the year before. The vast majority of readers are in the United States (84%), but there were about 3% from Canada and 1-1.5% from India and the Philippines. When it came to popular content the most popular blog post was “Always Say Yes!” which had 166 page views, then the Pregnancy Glucose Test post that had 157 page views and in third was My Nutrition Journey which had 110 page views. Thank you for taking the time to read and support this website, my blog and my business. I have appreciated all your comments, you taking the time to read what I write and give me your feedback. I really enjoy having this outlet and using this platform to help provide nutrition education to people around the world! I am so thankful for a wonderful 2018 and excited for more wonderful opportunities in 2019.